Our staff have many years experience in both design and manufacture of specialist flight cases and transportable containers, thus providing you, the customer, with an opportunity of commissioning a superior quality customised case made at our premises at Welwyn Garden City. 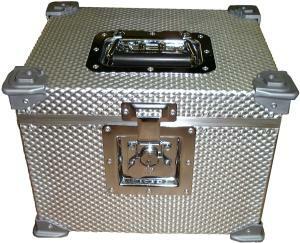 LEMSFORD cases are among the finest available for the protection of fragile and valuable equipment. They are fabricated from 14g s.w.g. rigidised aluminium with a pre-rolled stippled pattern to give maximum strength to weight ratio. The welded corner seams and weather proof seal between lid and base provide maximum protection for the contents. The lid is joined to the base by means of a continuous aluminium alloy hinge with strong steel pin. A perfect fit of lid to base, when closed, is ensured by the use of male-female extrusion and a neoprene gasket. Please visit our picture gallery and Product Info pages for more pictures. Most of our cases are made to order after we have spoken to you and obtained information about the equipment you wish to protect and sent you a quotation. Please contact us if you would like a quote. Alternately you can buy some of our cases and spares via our Online Shop. LEMSFORD cases are expertly tailored to suit your exact specifications and individual requirements. They are designed to withstand a tremendous amount of abuse and rough treatment to protect valuable, sensitive and expensive equipment. A wide range of fittings are available for handles, catches, feet, corner protectors, hinges etc. to personalise your case. Further details can be obtained on request.